Getting a smartphone or tablet can be intimidating for anyone, but this user-friendly guide is here to help you to get the most out of all your new gadget has to offer! 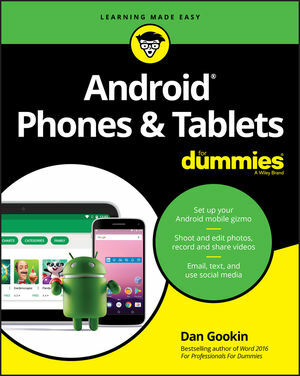 Whether you’re upgrading from an older model or totally new to the awesome world of Androids, this book makes it easier than ever to get up and running with the latest technology. From setup and configuration to taking advantage of all those intricate bells and whistles, Android Phones & Tablets For Dummies helps you unleash everything your Android can do for you. If you’re looking to use your phone or tablet for texting, emailing, accessing the Internet, or anything in between, you’ll want to keep this go-to reference close by every step of the way. Who needs a headache when dealing with a new device? This book makes it totally pain free! Dan Gookin wrote the very first For Dummies book in 1991. The author of several bestsellers, Dan enjoys worldwide success with books that have been translated into 32 languages and have more than 12 million copies in print.